Minquadale Fire Company is committed to the safety of our community, providing outstanding fire, rescue, and emergency care services, customer service and public fire prevention education. Minquadale Fire Company offers a Minquadale Memorial Hall for any of your special events. 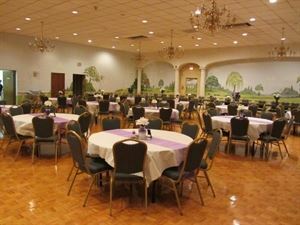 Memorial Hall is a full service banquet facility for all occasions. We provide professional quality food and services that will ensure that your event with us is an unforgettable experience. Not only do we provide a spacious and beautifully decorated hall for your event, but we also offer full catering service and bar option provided by the Minquadale Fire Company Ladies Auxiliary. Make your event complete by adding an open bar option. Our newly renovated bar is stocked for every taste, from beer to martini's, our courteous bartenders will make your event a memorable one. Minquadale Fire Company Memorial Hall is a full service banquet facility for all occasions. We provide professional quality food and services that will ensure that your event with us is an unforgettable experience. Not only do we provide a spacious and beautifully decorated hall for your event, but we also offer full catering service and bar option. Make your event complete by adding an open bar option. Our newly renovated bar is stocked for every taste, from beer to martini's, our courteous bartenders will make your event a memorable one. Please visit our website for complete rental details. Lunch/ Dinner Buffet Package Includes: • Imported ham or turkey breast, American & provolone cheese, parmesan cheese, pickles & olives, lettuce, tomato, coleslaw, potato chips, pretzels, rye bread & butter, assorted rolls, coffee, hot tea, floral centerpieces. - Choice of: • Baked chicken, meatballs, roast beef, roast pork, or sliced ham • Macaroni salad, mashed potatoes, parsley potatoes, potato salad or scalloped potatoes • Baked beans, corn, country style green beans, green beans, green bean almandine, green bean casserole, peas, succotash, or vegetable medley • Fruit, rice pudding, vanilla pudding, chocolate pudding, or jello Please review our attachment for complete menu details. Served lunch/ dinner package includes: • Rolls, butter, coffee, hot tea. - Choice of: • Baked half chicken breast with cranberry or apple sauce, chicken cordon bleu with cranberry or apple sauce, chicken leg & thigh with cranberry or apple sauce, crab imperial, ham, roast beef, roast pork with cranberry or apple sauce, stuffed breast of capon, or turkey & stuffing with cranberry or apple sauce. • Baked, mash, parsley, or scalloped potatoes. • Corn, baked beans, green beans, peas, succotash, or vegetable medley • Coleslaw or house salad • Fruit or tomato juice • Pie, Neapolitan ice cream with strawberries, pudding or jello. Please review our attachment for complete menu details.